At our six-seat sushi bar, you can order the freshest fish directly from our talented sushi chefs. Daily specials, and other exotic delicacies are available for your enjoyment. Our fish is delivered by air to ensure that it gets from the sea directly to your plate in the shortest possible time. 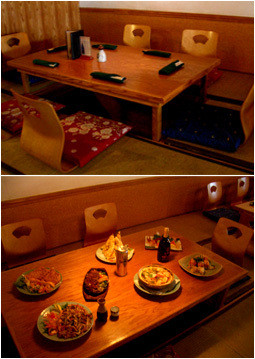 Come try our traditional tatami mats for a relaxing and enjoyable meal.